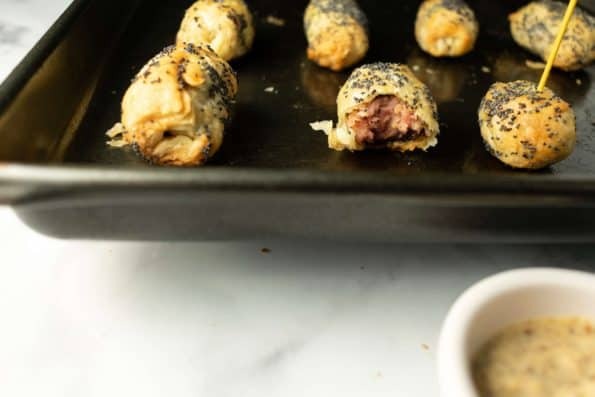 Puff Pastry Sausages in a Blanket are an addictive appetizer perfect for entertaining, that come together and disappear quickly! A quick detour from clean and healthy because…the super bowl. Super Bowl to me is basically a party for comfort food (aside from the game). I mean, right now my menu for the party I’m hosting is consisting of an array of carbs (including these bad boys) – plus chili. Okay and a veggie tray too because someone should eat that. Yeah, if you haven’t guessed by now, I’m treating Super Bowl as my big ‘ol cheat (treat) day. Speaking of which, we should talk about balance for a minute. If you follow me on my Instagram account – and you totally should, you know I’m a big advocate for moderation and balance. We all set our own rules for what this looks like. Whether the scale is 50/50, 80/20, or 25/75. The key takeaway here is that so long as rewards and cheat meals fit your own definition of moderation – you’ll feel balanced. On a diet, indulgent meals might be more restricted, but having one in moderation (say, once a week) will actually HELP in the long run because it will give you more willpower to stick with it, improve your morale, and more importantly, raise your levels of the hormone Leptin which in short stabilizes our appetite and regulates metabolism. So, with that being said – its important to eat what you really want every now and then (Bite your Cravings…get it??) Sorry, had to do it. Stick with low calorie drinks like water, seltzer, light beer, wine, and non-soda or juice for mixers (at least low sugar types). Make a plate instead of endlessly picking. We’ve all been there and know how that goes. Control how many pre-frozen finger food appetizers you’re having. These are often high in saturated fat (good to note if you have high Cholesterol) which means they are also high in calories. 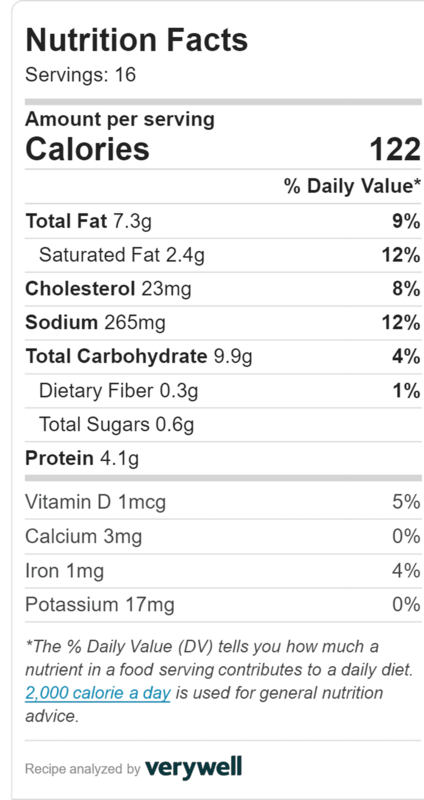 This makes for one calorie dense small little finger food. Stop when you’re content! This sounds like common sense, but it’s so easy to get caught up in talking and continuing to eat socially for all 3-4 hours of the game. This is where making a plate is key, but also keep a tab on your actual hunger in the back of your mind vs. eating because its there. 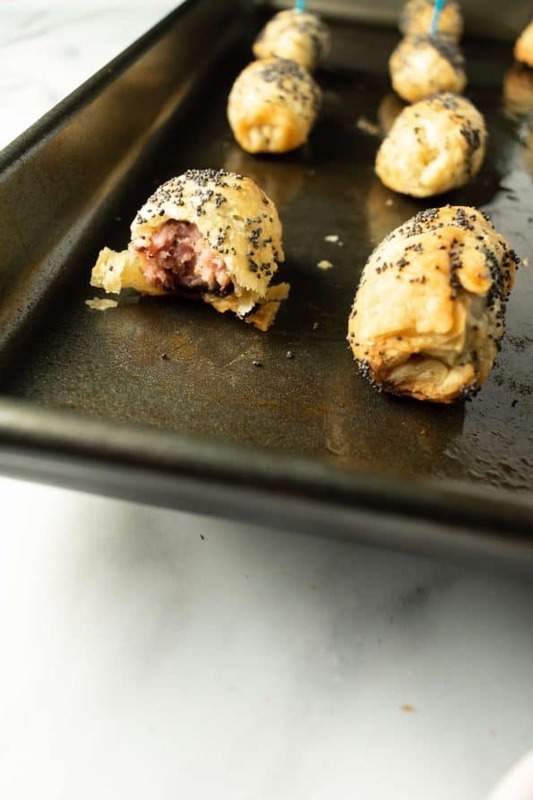 Now, back to the Puff Pastry Sausages in a Blanket. I’ve been making these for about 6 years now and they are delicious each and every time! 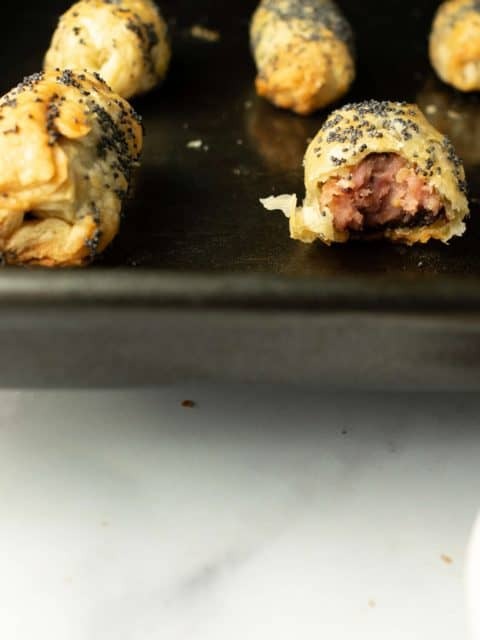 It’s like a grown up Pig in a Blanket – which are still my weakness at a party (because of the pastry dough!). 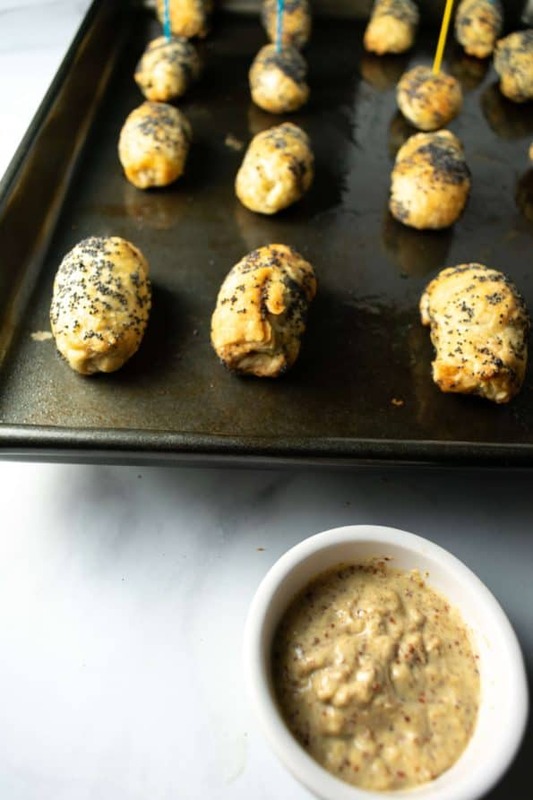 The poppy seeds also add a great nutty flavor to the whole thing – its too easy to keep popping these in your mouth! 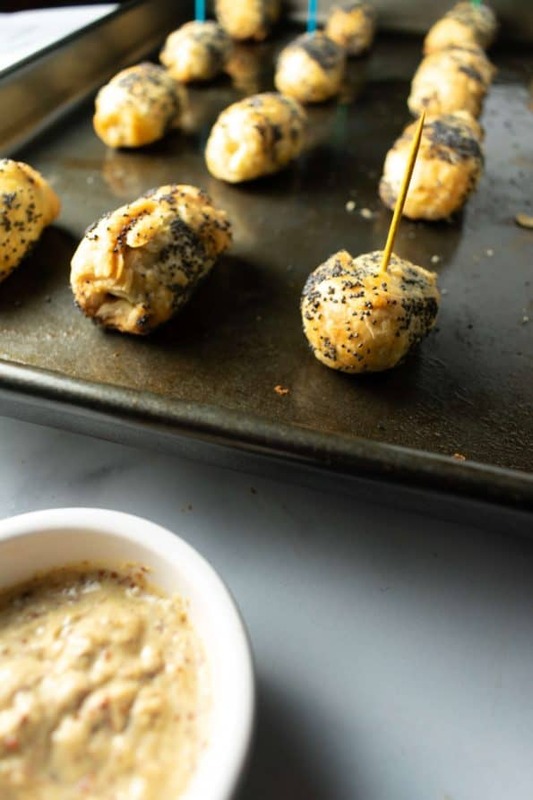 They have a decent amount of saturated fat, so I would not make these for dinner! To make an even healthier version, simply swap out the pork sausage for chicken sausage which will easily cut out 500 calories from the whole recipe. These take minimal prep time, uses only 4 ingredients, and disappear just as quickly! Unfold the defrosted pastry sheet and lay it down on a baking sheet. Spread out in each direction using your fingers to nearly double the sheet in size, but not making it too thin where it will rip. With a knife, cut the sheet into 16 equal squares. Cut the sausage links (with casings removed) into quarters, so you have 16 pieces in total. In a skillet, cook the sausages on medium-high heat until browned on the outside, about 8 minutes. Drain the grease on a paper-towel lined plate. Take one pastry square and one sausage quarter and roll the puff pastry around it. You can fold the sides in or tuck them inside. 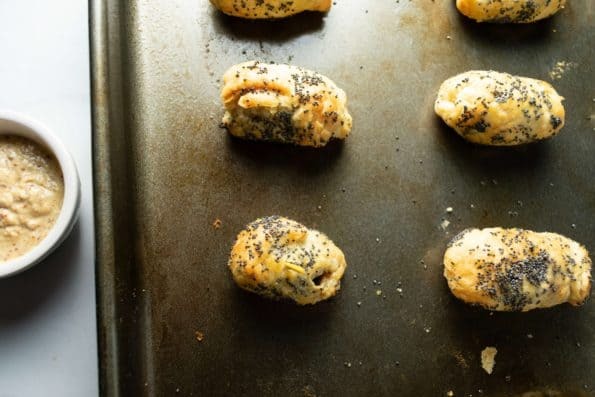 Brush a tiny bit of egg wash on the seams to seal and secure - as well as brushing the entire thing with a little egg wash.
With the poppy seeds in a bowl or on a plate, either roll your sausage into the seeds or drop them on using your fingers, covering all sides. Place back on the baking sheet. Repeat to remaining 15 sausages. Bake for 15 minutes or until pastry has puffed and browned slightly. Dip into spicy brown mustard or ketchup. You can use toothpicks to make cute finger hor d'oeuvres!